WIN A 3 DAY PPV PASS TO WATCH THE MOST EXCITING TAR LIVE STREAM YET! The Action Report is proud to announce our latest production. 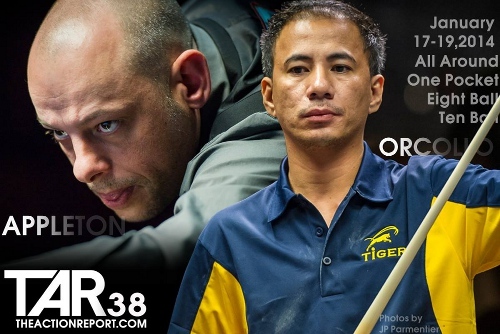 TAR 38: Darren Appleton vs Dennis Orcollo. TAR 38 will take place at the TAR Studio in Las Vegas, Nevada on January 17th thru 19th. The match format will be an all around consisting of One Pocket, Eight Ball and Ten Ball. Who do you think will win the Ten Ball match - Darren or Dennis? There's no wrong answer - just respect our sponsor's generosity when claiming your entry. 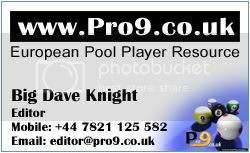 ...You can enter here in the BA forums and check the full list of entries on the Pro9 forums. We're still accepting entries for the free PPV competition here! Winner = Darren Appleton or Dennis Orcollo? "Ceteris paribus" (Other things being equal), I'll always be rooting for Dennis. Several years ago he tested my cue. Daz is yet to win a TAR clash, believe it or not. Why not this time? He turned into a monster all-around player. Go Daz!!! Here's another Podcast - this one is from last night and features Darren Appleton and Dennis Orcollo! The match stream starts tonight - and they continuously replay the stream in a loop until the next day's action, so you don't need to stay awake all night - you can watch it tomorrow morning - fantastic! I'm still accepting entries to our competition for another 9 hours from now when we will have the EuroMillions Lottery pick the winner.